One of the most notable points-of-pride in the United States is the nation’s portfolio of world-class academic institutions, with the U.S. dominating the global rankings of top universities. Indeed, although the U.S. is home to only 4.3% of the world’s population, 43% of the world’s top 100 universities are located in the U.S. The USA’s signature research universities are a national asset of great historic and current significance. Into the future their importance will come even more to the forefront in our increasingly knowledge-driven, innovation-based economy. In terms of promoting full recognition of the multi-faceted mission and benefits of university presence in localities, regions, and states, understanding the full-range of functional impacts generated by universities is vitally important. TEConomy has enjoyed the privilege of working with universities, state and federal government agencies, and economic development organizations across the nation and internationally in examining the impacts of academic institutions and developing strategies to further advance these impacts. In combination with a review of the literature, this experience has enabled TEConomy to develop an illustrative model for discussing university functional impacts (Figure 1). Spur a mutual understanding and appreciation of the importance of Indiana’s universities and university-based research in all its forms among policy makers, university officials and faculty, economic developers, students, research funders, commercial enterprise, and other key economic and societal stakeholders. TEConomy finds that the future of the United States is very much tied to the performance of a complex research ecosystem – an ecosystem in which research universities serve a series of unique and absolutely crucial functions. 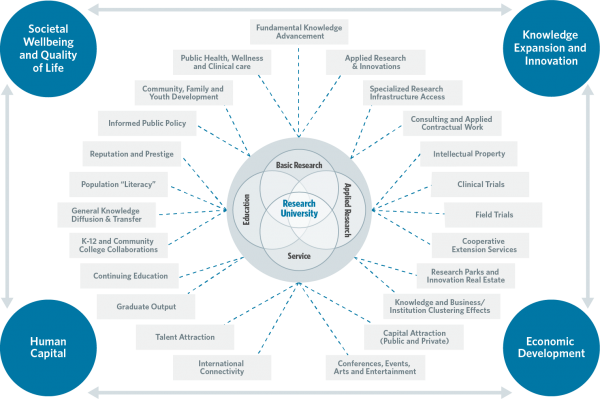 In considering the future, it is also found that elements of the research ecosystem are threatened by external forces and trends that risk eroding the foundations of American research leadership – and that research universities must be provided with strategic support and assistance to ensure they continue to provide a robust competitive advantage for democratic, social, and economic progress.